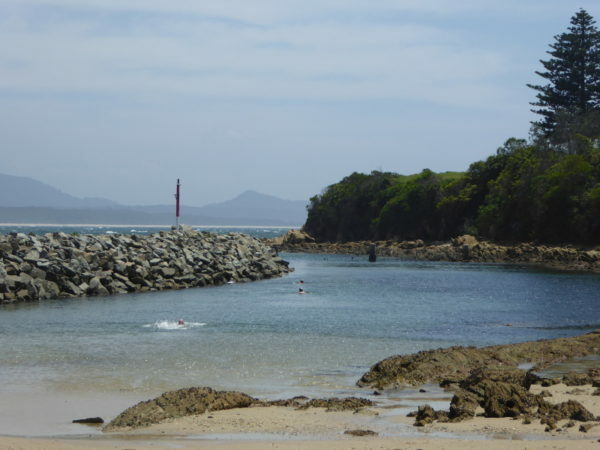 The best time to come to Killcare ring of stones rock pool is at high tide on a calm day. Then, locals tell me, it’s like being in a swimming pool. 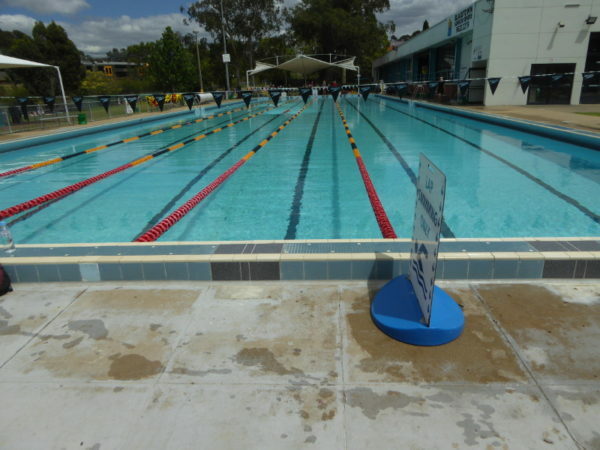 I almost made it on both counts, so managed a bit of a splash around on my back, but didn’t really get to do a lap or even turn those arms over for freestyle or back stroke. I had noted down high tide times but got snarled up in traffic through Sydney so by the time I got to Killcare, I’d missed the high by about an hour. And, boy, the water at Killcare goes out fast. A Mum and her toddlers were messing about in the shallows and told me an hour earlier the water had covered all the sand right up to the sea wall, but that if I had waited a few more hours, I’d have had sand right out to near the ocean wall. There is a deeper section (I was told after I’d got out), but that’s right up by the wall on the ocean side. 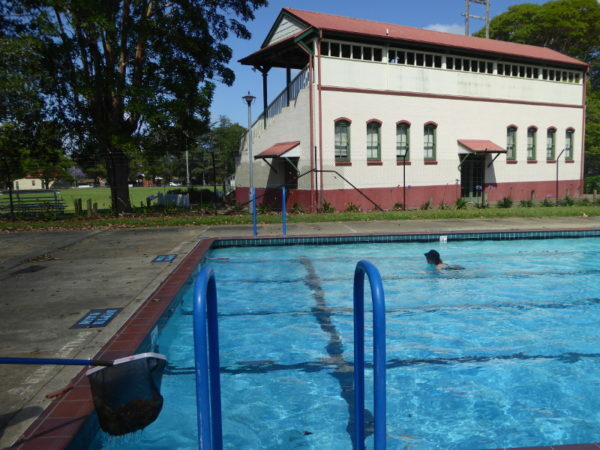 And at high tide on summer’s days, it’s a spot locals seek out to jump into the pool. I might have to return to Killcare to have a go at that one. 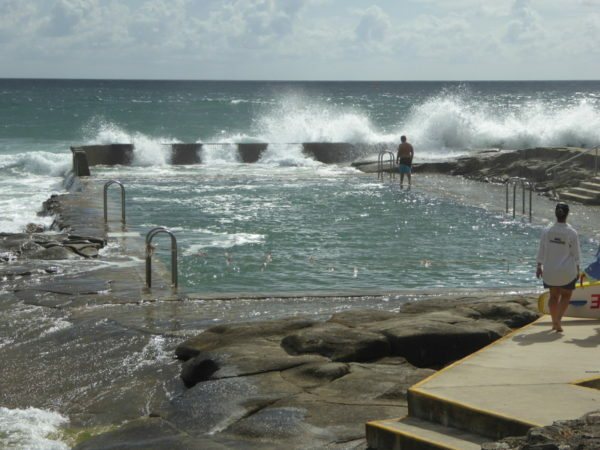 So Killcare rock pool is more of a paddling pool or at best a wading pool for most of the day. But it is a truly beautiful spot. The ring of stones were placed down at the very southern end of Putty Beach, which curves serenely round the bay. Some rings of stones are completely covered at high tide, like at Copacabana and Maroubra, but the rocks stand above the waves all the time at Killcare so you can’t miss the spot, and it’s right in front of the SLSC building. I was there on a warm morning in late September, and could feel the benefit of the rising temperatures. I still kept that swim cap on but there was no shock of cold this time, and hopefully there won’t be anymore for the summer months ahead. The surf was good enough to attract a few folk onto their boards for a display of surfing just by the rock pool, and that same surf meant a fun time in the pool as waves washed over me in those shallows. And a good 90 minutes after the high tide a woman who was admittedly a fair bit shorter than me was managing to wade at chest height and did a few metres of breaststroke. So Killcare is not a high-tide-only pool, but if you want a decent swim rather than a dip, get your timing right at Killcare. Lots of parking near the Killcare SLSC. Don’t make my mistake and follow the little road signposted to Putty Beach – that takes you into Bouddi National Park and a parking area half way up the bay. At high tide, there will be no beach so you’ll need to leave your things on the rocks and wade in. At lower tides there is space on the sand to leave clothes. Get in by paddling in from the beach – or if you’re lucky with your timing, jump in off the far wall. 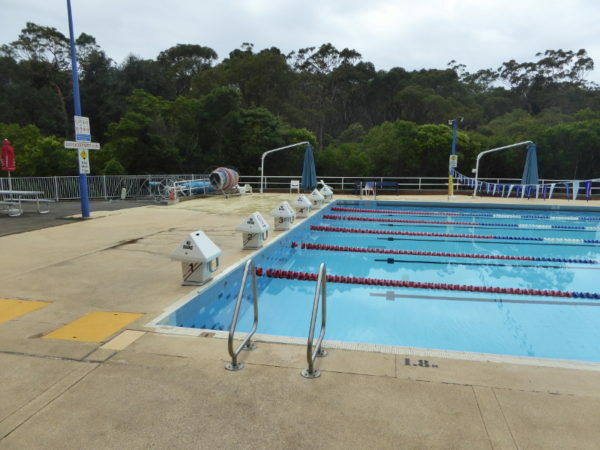 There are two showers in front of the SLSC building outside, still within view of the rock pool. And there are three more showers inside the toilets. Get to Killcare as close to high tide as you can. Otherwise you might be going for a paddle. 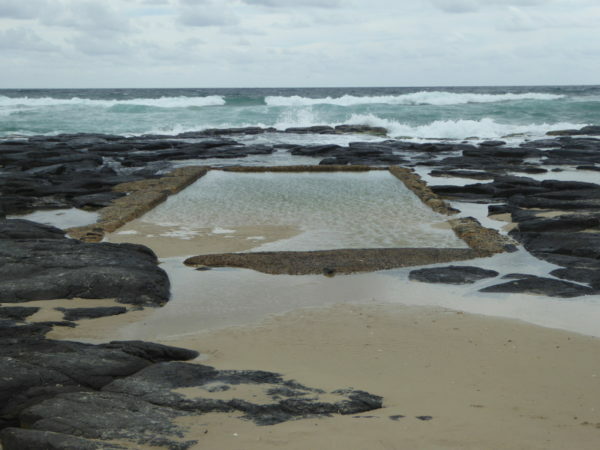 I read on the All Into Ocean Pools site that Killcare’s Putty Beach ring of stones have been in use since at least the 1920s, but I have found no further history, nor even any press clippings on the usually helpful Trove website. Just the Mum and her two toddlers playing in the sand after the tide went out a bit. She’s the one who told me about locals jumping off the rocks on the far side on calm days. I like this YouTube video of Killcare Rock pool, though he obviously came at low tide so there wasn’t much swimming going on! Killcare beach kiosk allows you to have a post swim coffee and watch the surf. You can watch others in the rock pool too from the seating area by the kiosk. They serve up a decent Danes Coffee and home bake the muffins and scones (with jam and cream…) themselves.